An emergency fund can save the day and reduce your financial stress. Find out why you need one, how much you need, how to build an emergency fund, and where to store it. I used to think that emergency funds were for rich people. My thought process was a little like this: must be nice to be so rich that you can have money just sitting around. Sorry, I’ve got bills to pay and lots of debt – I need to use that money now! Well, as I’m sure you have guessed, I was wrong. Everyone needs to have an emergency fund, especially if you don’t have a lot of money. An emergency fund is a financial safety net. When smart planning and careful budgeting get rocked by an unexpected crisis (which happens to rich and poor people), your emergency fund keeps you financially afloat. An emergency fund looks different for each person and family. It changes as your financial situation changes. This guide addresses the importance of having an emergency fund, how much money needs to be in your emergency fund, and where you should keep your emergency fund savings. An emergency fund is money that is set aside that can only be used in case of an emergency. It is a separate fund that you can immediately access when disaster hits. You can be the most conscientious budgeter who tracks every penny but that doesn’t exclude you from the inevitable emergency. Emergencies happen to everyone and they often have a price tag associated with them. An emergency fund gives you the means to financially handle an emergency. Without an emergency fund, an unplanned expense could mean that you are unable to address or fix a major problem. You are putting yourself and your family at risk. In some extreme cases (like a job loss), your emergency fund can cover your basic needs – shelter, food, and heat or A/C. In many other cases, emergency funds protect your health, life needs (like having an operable car), and your financial stability. Emergency funds help you avoid going into debt. An emergency (from a financial viewpoint) is an unplannable event requiring immediate attention and having a significant impact on your finances. One of the most serious financial emergencies is a job loss. Without any money coming in and with typical expenses going out, you have negative cash flow. Eventually, your savings (if you have any) will be depleted. This may leave you with no money for your bills, including your basic necessities. This is an emergency. When experiencing an emergency, your emergency fund should be used. An emergency is devastating enough; an emergency fund can help the financial aspect of dealing with your emergency. An infrequent expense is NOT an emergency. Just because you don’t get a bill every month doesn’t mean you should be surprised by the expense. Bad news, or an annoying bill, does not equal emergency. You need to plan for the annoying, infrequent expenses in your life with sinking funds. You need to plan for the emergencies with an emergency fund. It’s best if you (and your spouse) determine what is classified as an emergency and what isn’t. This way, when an expense arrives, you have already decided if it’s an emergency or not (and you know whether you can or can’t use your emergency fund). The amount of your emergency fund depends on your specific situation. It is different for each person and family. The amount may fluctuate throughout your life because your needs and financial situation change. The general rule of thumb to follow is that you should have between three and six months of expenses in your emergency fund (assuming you are debt-free except for your mortgage). 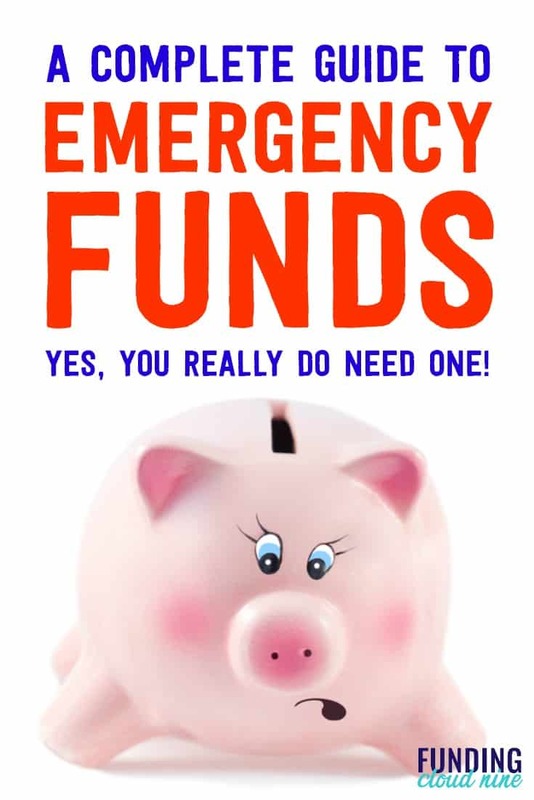 You may want a larger emergency fund (6 months or more) if you don’t have a lot of job security, you have medical issues, don’t have an easy way to make extra money, or you simply feel more comfortable with a larger financial cushion. You may choose a smaller emergency fund (around 3 months, or even less) if you have a very secure job or can easily earn extra income. You can choose to only include your necessary expenses (food, shelter, heating, fuel, etc.). For help calculating your necessary expenses, you can create a bare bones budget. Alternatively, you can choose for your monthly expenses to include your average monthly spending (from your regular budget). This would include things like clothing spending and restaurants. Or you can choose something in between. It’s your choice. Your emergency fund will be smaller if you include only your necessary expenses. Your emergency fund will be larger if you include your average monthly expenses. To calculate the amount you should keep in your emergency fund, multiply the number of months (step 1) by your monthly expenses (step 2). On a recurring basis (once a year), determine if the amount in your emergency fund still meets your needs. Has your life situation or budget significantly changed? Does that warrant an increase or reduction in the amount in your emergency fund? You may also want to reassess the amount in your emergency fund when you have a major life change such as getting married, having a baby, or moving. Now that you know how much money you need in your emergency fund, it’s time to start saving. The very first thing you should do is determine how much money you already have that can be reassigned to your emergency fund. You may have a lot of money in your daily checking account that can be used for your emergency fund. You may have money in sinking funds that can be reassigned to your emergency fund (having an emergency fund is likely more important than your sinking fund). A tax refund, gift money, or bonuses at work may also help build your emergency fund. Start selling things you don’t use or need – clothing, furniture, artwork, etc. Temporarily cut your expenses. A good place to start is your grocery budget (by saving money at the grocery store or by meal planning). Your emergency fund should be kept in a savings account. A high-yield savings account is best, but not required. This means you should look for a savings account that has a high interest rate. The reason that savings accounts are the best place to store your emergency fund is because the money is easily accessible. In an emergency you will need to withdraw money immediately. Your emergency fund should also be separate from all of your other money – it should be separate from your daily checking account and any other savings accounts you use for other savings goals. If you have a financial emergency, withdraw the money from your emergency fund to pay to fix the situation. Then, try to reduce your monthly expenses until you are able to replenish your emergency fund. You may want to add “emergency fund” as a budget category in your monthly budget. Life will throw you curve balls. Not everything can be planned or expected; emergencies happen. You should set yourself up financially so that you are able to financially handle an emergency. You don’t want the added stress of having to figure out how to pay for whatever crisis life hands you. Emergency funds will help you avoid going into debt. Emergency funds are a financial buffer. Do you have an emergency fund? Have you ever had to use your emergency fund? Great tips to create peace of mind. Having some extra funds kept away at all times for an emergency is crucial for financial independence.